The following information is a partial reprinted from a document released by USPS. Learn more at USPS Postal Pro. 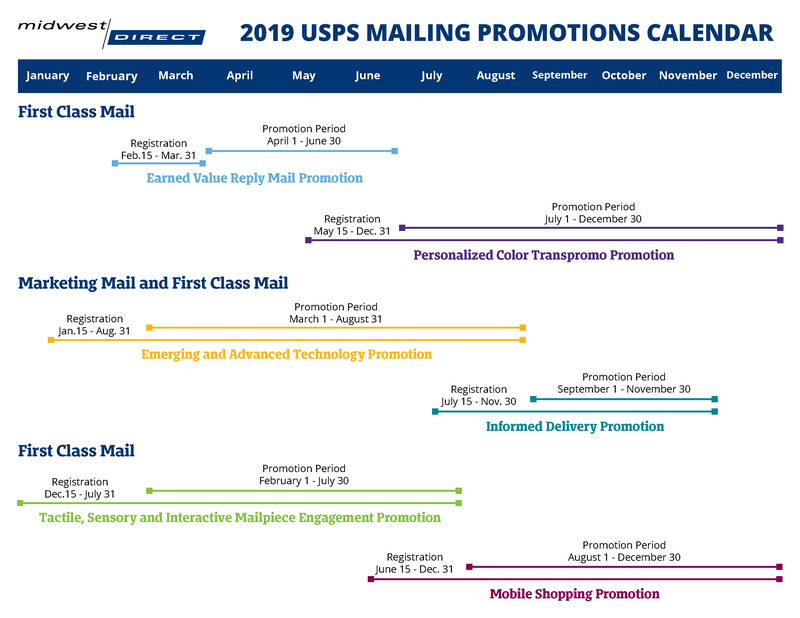 Download our 2019 USPS Promos Calendar now! Building upon the success of the Promotions Calendars over the last few years, the Postal Service has developed a Promotions Program for Calendar Year (CY) 2019. The 2019 Promotions continue to encourage marketers, printers, and mailers to utilize new technology and print techniques that enhance the traditional benefits of a physical mailpiece. This, in turn, can drive higher response rates and increase the overall return on the mailer’s investment in the mail. Regular and Nonprofit Marketing Mail letters and flats that meet the promotion requirements will be eligible for an upfront 2% postage discount during the promotion period. To participate, you must register in advance of the promotion. For help, contact our postal experts! This mailing program encourages mailers to incorporate emerging technologies such as AR, VR/MR, NFC, video in print, multichannel mail integration with addressable TV or digital assistants into their direct mail pieces. Regular and Nonprofit Marketing Mail letters and flats, and First-Class Mail presort or automation letters, cards, and flats that meet the promotion requirements will be eligible for an upfront 2% postage discount during the promotion period. Encourages mailers to continue to distribute Business Reply Mail (BRM), Courtesy Reply Mail (CRM) and Share Mail envelopes and cards by providing them with a financial benefit when their customers put those pieces back in the mail. New Participants will earn a 3 cent credit per counted reply piece between April-June of 2019. Repeat participant must meet a threshold equating to 95% of the volumes counted during the same period in 2018 to earn the 3 cents per piece credit. Credits may be applied to postage for First- Class mail presort & automation cards, letters and flats, and Marketing Mail letters & flats, and must be used by December 31, 2019. Enhances the value of First-Class Mail by encouraging mailers of bills and statements to incorporate color messaging in order to foster a better connection and response from their customers. First-Class Mail presorts and automation letters—bills and statements only—that meet the dynamic print and personalization requirements will be eligible for an upfront 2% postage discount during the promotion period. First-time participants must meet only the dynamic color print requirements. This program encourages mailers to integrate their direct mail pieces with mobile technologies that facilitate a convenient online shopping experience for consumers during the holiday season. There are many new mobile barcode formats that can be leveraged to qualify for this promotion, in addition to the use of Payment QRs to facilitate a seamless shopping/purchase experience. Regular and Nonprofit Marketing Mail letters and flats that meet the promotion requirements will be eligible for an upfront 2% postage discount during the promotion period. Encourages mailers to adopt the use of the USPS’ new omnichannel tool, Informed Delivery. Participants may create Informed Delivery campaigns through the Portal or submit elements through their eDoc submission. Regular and Nonprofit Marketing Mail letters and flats, and First-Class Mail presort or automation letters, cards, and flats that meet the promotion requirements will be eligible for an upfront 2% postage discount during the promotion. Reprinted and adapted from USPS.